The Golden Oldies Truck Club Inc is recognised by New South Wales Roads and Traffic Authority as an historic vehicle club. Accordingly, members are able to register vehicles which have been approved by the Club Registrar as being eligible. Click here to view "HISTORIC VEHICLE POLICY (April 2002) - pdf file". This policy was produced by the Roads and Traffic Authority (RTA) in conjunction with the Council of Motor Clubs, the Council of Heritage Motor Cubs NSW, the Old Motoring Club, the XW-XY Falcon Owners Club, The Classic Italian Motorcycle Club and the Velocette Owners Club. 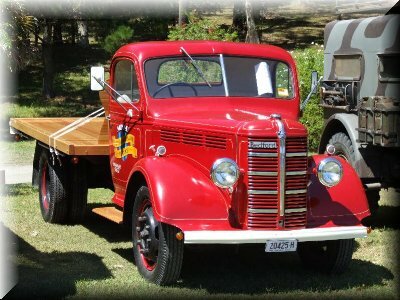 HISTORIC COMMERCIAL VEHICLES - GUIDELINES TO CLUBS FOR OPERATION, LOADING AND INSPECTIONS. Click here to view a letter from the Council of Heritage Motor Clubs following agreement with the RTA (NSW Roads & Traffic Authority "Guidlines - CHMC.pdf". ).